Although it makes a few appearances in the Old Testament, the tiny Galilee village of Yokneam lacks the Bible-era cachet of its high-profile neighbors like Nazareth and Megiddo. But in modern times, this Israeli town has a unique claim to fame: hidden within Yokneam's hillside industrial parks is perhaps the world's largest concentration of aesthetics-technology companies  firms that are developing new techniques for smoothing wrinkles, removing unwanted hair, combating acne and, most lucratively, flattening your belly. The battle of the bulge is perhaps an unsurprising undertaking in a country that is so distinguished by its military. Indeed, much of Israel's $26 billion high-tech industry relies on military technologies that have been repurposed for civilian use, according to Dan Senior and Saul Singer, authors of Start-Up Nation: The Story of Israel's Economic Miracle (Twelve, 2009). The Yokneam-based company Given Imaging, for instance, borrowed technology from electronic navigation systems on fighter jets to develop the PillCam in 2001  a tiny swallowable camera that beams images from inside the body to aid in medical procedures like the diagnosis of tumors. In Tel Aviv, the $140 million biotech firm Compugen develops DNA-sequencing devices for drug companies including Pfizer and Merck using computer algorithms originally designed for hunting terrorist groups. And then there's Ultrashape, a body-contouring firm that was founded in 2000 by plastic surgeon Dr. Ami Glicksman and physicist Yoram Eshel  both military vets  who have since built an almost $40 million-a-year fat-busting business. It is among a cadre of companies reaping hundreds of millions of dollars in revenue each year exporting the promise of beauty from the Holy Land. Ultrashape's technique, which has been used more than 200,000 times in 57 countries, involves employing high-intensity ultrasound waves guided by a sophisticated tracking and delivery system to explode unwanted fat cells  much the way heat-seeking missiles destroy enemy objects. It works like this: Ultrashape's wand-like transducer pulses ultrasound waves into the flesh that burst the fat cells; once the cells are dead, Glicksman explains during an interview in a suburban Tel Aviv café, they're gone forever from the treated area. "The fat is then converted into glucose, processed by the liver and then ultimately released from the body," says Glicksman, who has researched ultrasound waves and developed Ultrashape as a safer alternative to liposuction. "You're obliterating fatty tissues." The procedure feels like fiery zaps, only an instant long, which cause an almost  almost  imperceptible burn. "Phantom heat" is how Glicksman describes the sensation; the procedure occasionally leads to blistering after it's completed. "It's as if you've stood too close to a stove for a split second," says Canadian patient Julie Weimer, who tried Ultrashape in 2009 and melted 1.5 in. (3.8 cm) from her waistline. It sounds like high-tech quackery, but the science behind the system is legit, says Dr. Richard Warren, clinical professor of plastic surgery at the University of British Columbia in Vancouver. (Ultrashape is approved for use in Canada.) The technology employs the same sound waves used to scan a fetus in the womb, and it is similar to the high-intensity shock waves used to break apart kidney stones inside the body. But Ultrashape's ultrasound waves operate at a far lower frequency than those used for imaging, and their level of acoustic pressure  or sheer force  is precisely calibrated to target and destroy fat tissue just below the skin while steering clear of vascular and muscle tissue. "We know the [Ultrashape] technology works, and we know that it's safe," says Warren, who has studied the product independently. "It really does 'melt' fat as a walk-in/walk-out procedure." Whether the U.S. government agrees remains to be seen. Ultrashape  approved by the European Union for use in 2005  hopes for a yea or nay from the U.S. Food and Drug Administration (FDA) in early 2011. One hurdle to approval may be the procedure's inconsistency: According to nine clinical trials funded by the company between 2004 and 2008, patients undergoing the four-session, six-week program lost an average 1.3 to 2.5 in. 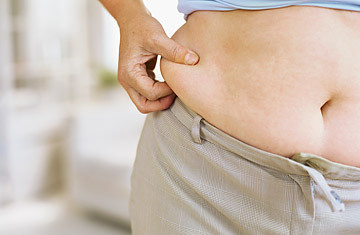 (3.3 to 6.3 cm) from problem areas like love handles and bulging tummies. But while in extreme cases some people shed up to 4 in. (10 cm) or more, others walked away with no noticeable difference. "As a surgeon, I want reliable, dramatic results," says Warren, whose practice does not use Ultrashape. "With Ultrashape, there isn't that guaranteed effect like you have with liposuction." But if the FDA gives it a green light, Ultrashape is guaranteed a huge market in the U.S. Already it's gotten attention from the doyenne of national trends and a longtime struggler with weight, Oprah Winfrey, in the May issue of O magazine. And it is not the only nonsurgical fat-demolishing treatment on the horizon: LipoSonix, based in Washington State, also uses ultrasound waves, with a higher reliance on heat, to destroy fat cells; the system is used in Europe but is not yet available in the U.S. Another company, Zeltig, in California, is developing a method for destroying fat cells by cooling them to death. Back in a clinic in Yokneam, I decided to go under the Ultrashape transducer myself, enduring 476 fiery zaps to my ample stomach area during a 45-minute session. I was warned to lay off heavy foods the following day and to expect results  even after just one session  about a week later. I ignored the former but did notice the latter  a slight looseness in pants that had previously been unforgiving. No, I hadn't shed a whole belt size or suddenly squeezed into my skinny jeans, but I hadn't lifted a weight or broken a sweat in the past week either. Is it too good to be true? Dotted with ho-hum office blocks and scrub-like forests, Yokneam may not be the likeliest site for miracles (and it clearly lacks the atmosphere of Jesus' nearby hometown), but when it comes to weight-loss cures, the desperate and the believing are legion  and this ancient village, where Crusaders once marched, may just prove to be their promised land.